With summer just around the corner, most of us are ready to show our lumpy cellulite to the door… how about you? What if I told you it was possible to smooth out dimples while relaxing and getting pampered a bit? Cellulite reduction massage offers all the health benefits associated with massages as well as helping to reduce the appearance of dimpled skin. Here’s a brief overview of cellulite massage and why it may be the treatment you’re looking for. How Does Cellulite Form In The First Place? It helps to understand how cellulite develops to appreciate the benefits of getting massage treatments to reduce its appearance. The beginning stages of cellulite start far beneath the skin’s surface in the subcutaneous fat cells and surrounding connective tissues. With each passing year, the fat cells begin to enlarge due to decreased circulation as well as toxin and waste accumulation within the body. While the fat cells become larger, the surrounding connective tissue shrinking. Although this process is completely normal and part of the aging process, it results in a dimpled appearance resembling an orange peel. Cellulite reduction massage offers an advantage over the majority of topical treatments because of the way cellulite forms. Because the condition begins deep under the surface of the skin, the majority of topical creams and lotions offer little help; an exception being those creams designed with delivery systems to allow the right ingredients to travel deep within the skin to reach fat cells. Cellulite massage, on the other hand, is designed to work beneath the skin’s surface so it can address the issue right at its source. How Does Massage Reduce Cellulite? A massage designed to reduce cellulite is similar to a deep tissue massage. Target areas are those experiencing cellulite problems. A cellulite reduction massage helps by improving circulation, increasing blood flow and improving the appearance of the skin. In addition, massage treatments promote waste and toxin elimination which results in improved skin appearance as well. By targeting local problem areas, fat cells can be softened so the body has an easier time of releasing them. Certain essential oils aid in the cellulite reduction process including peppermint and lavender. They help to stimulate the skin while leaving it soft and smooth. For best results, treatments will typically need to be performed every so often to maintain the improved condition and appearance of the skin. Cellulite massages can be performed by a massage professional or using your own cellulite massager at home. Many women prefer at home treatments because they can better contain costs and control the frequency of massages. Either way, the benefits of cellulite reduction massage are worth considering. 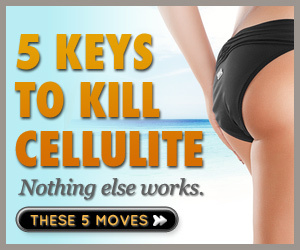 Click Here Now to discover how this step-by-step system can help you become Cellulite Free Forever! Can A Cellulite Massage Machine Help You?